Its no secret that recently I've enjoyed excursions into the world of Middle Eastern perfumery. This came about after a fellow enthusiast named Simon, sent me a bounty of tiny cotton swabs, each of which had been anointed with exotic eastern oils. 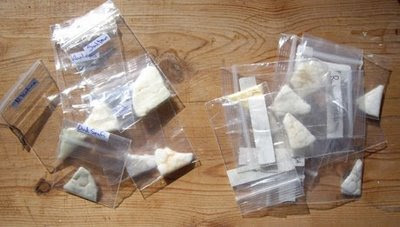 Like little bags of narcotic substances, when I came to open that fragrant parcel in my home, I introduced my nose to new aromas that I'd never smelled the likes of before. My office space remained thick with odiferous molecules for many days after. And therein lies the challenge... these days I find it almost impossible to be wowed by a new perfume. It seems every time I sample newly launched scents, they are, more often than not, rehashed and reworked releases from the past... which is why this journey into eastern oils has been an exciting adventure. Prior to this, I'd have asked "who knows what a gazelle smells like? ", or "what is the odour of a wood fungus?"... but the answers were right there - their molecules transferred carefully onto small pads of cotton. I noted that many of the carefully-packaged bundles were labelled "mukhallat", which is a term I later learned is applied to a "mix" of various perfume oils. 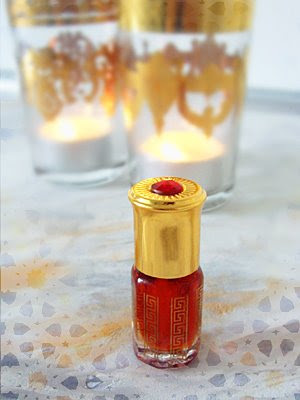 One of the shining stars amongst these test swabs, was Mukhallat Al Emirates, a very robust and opulent elixir. This is a scent that is brimming with crisp musks, but also gives the impression of being thick like molasses... like one is wading waist-deep through aromatic velvet-petalled roses. There is also a delicious puff of oud-like incense beneath the floral heart that teleports the wearer to the colourful bustling souks and medinas of the East. I was won over. Mukhallat Al Emirates is a three-dimensional scent that surpasses the best of any of the highly popularized Montale offerings. As an oil, just a tiny dab is sufficient to last an entire day. And at around $8 for a quarter tola of oil (one tola being 12ml), it offers excellent value for money. Thanks for the message 'anonymous'. If you are familiar with Basenotes.net, kindly contact the user named "abubakr_al-misky" in the basenotes community - he was my original source of this scent. Best of luck finding it. I searched for Mukhallat al Emirates in google and the first link was the above one. Fraddicted: Are you an Enabler?